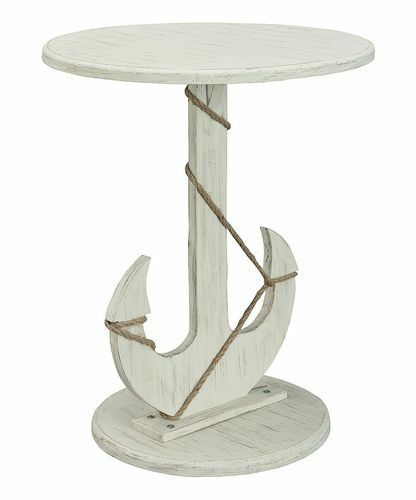 I’m making an Anchor Table for my nephew’s wedding on Sept. 1st. I cut it out and ready to sand. Most of my other projects are from softwoods. But this maple seems real hard. I’m ignorant on wood types. So I have an 80 grit on my oscillating spindle sander. Trying to sand down the high spot from cutting with a saber saw. 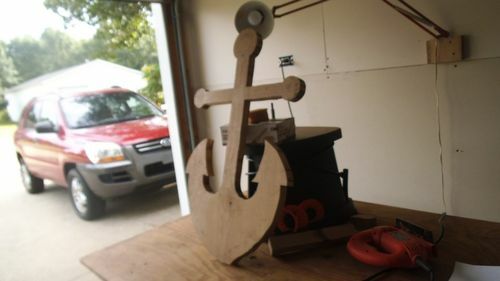 Really wavey, and it’s tiresome holding the anchor on the sander. Should I start out with a lower grit, like 60 or 40? or should I continue to persevere with 80 grit. See pics. I’m not good at routing, but if that would do the trick, I’ll farm that job out. Saying Maple can cover soft stuff with a Janka hardness of 700 for Silver Maple (yard maple) up to 1450 for hard maple, so taking some off can be a chore if it’s some of the harder stuff. 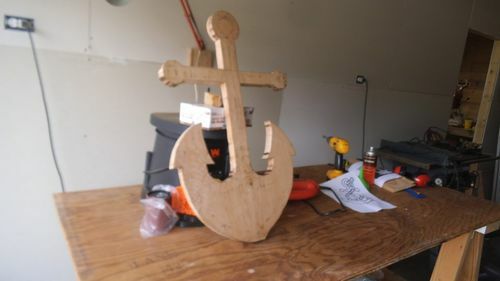 That is a fairly large object, so you are probably going to be in the bring the tool to the wood, work mode, rather than bring the wood to the tool. If you have a belt sander that cuts it down pretty quick, hand planes can make high spots disappear, or laying two flat, same height runners over top of it you can use a flat cutting router bit, and work the board flat, and easily knock off high spots. Google router sled, a pretty easy to do project. Look at you tube for videos about the router sled. Depends on the tools you have available, and are most comfortable using. Posting this because the same method can be used for a hand plane, and a belt sander. Using either chalk, or a pencil to scribble across the surface you can keep checking how much you are removing so you don’t end with a wallow. A straight piece of wood, or metal with a true straight edge can be used to sight down the board to let you know if you are going flat or not. He said he’s using a spindle sander to remove irregularities from cutting with a saber saw, not flattening the surface. I run mesquite with a hardness of over 2300 (at least according to the Wood Database) on mine and it cuts very quickly. Perhaps your sleeve is worn. You can flip it over on the spindle if you haven’t done so already. Otherwise, maybe it would be good to go down to 60 grit. Be sure to use the largest spindle sleeve you can. It will make it easier to get a smooth line and the larger diameter will mean faster cutting due to a higher linear velocity. You can switch down to smaller ones when you need to get into tight places. Do you have a half round file. Even a old worn file will cut wood very nicely. I hate sanding why do we call it sanding it’s more like wood grinding. A spokeshave or two would work like a champ. A rasp or file would work great as well. Thank you everyone for your great feed backs. Yes, I should have been more detailed what I was trying to do. Just the edges, not the face. My friend had a trim router and showed me how to use it. The rest will be done by hand. And file in tight space. Then I’ll use my orbital sander to finish the two faces before staining. Again thank you. I’ll post the finish product if you’re interested.